If you need a replacement, or think it’s time to seriously consider it, Harvard’s Total Knee Replacement guide is invaluable. This guide can help you make that important decision, in consultation with your primary care doctor and orthopedic specialist. You’ll find a list of critical questions to ask your doctor to help ensure you have the best possible surgeon. The guide explains why people end up needing knee replacement, the alternatives to surgery, the different types of knee implants, the risks and complications of surgery, and how to make a safe and full recovery. Your knees have been bothering you for a while. They’re stiff and achy when you get out of bed… Crunch and creak when you go up and down stairs … And painful when you stand up after you’ve been sitting for a while. If you’re like most people your doctor may be telling you it’s time to consider surgery to have a total knee replacement. In fact, 730,000 total knee replacements are done each year, making it the most common inpatient surgery in the U.S.
Total knee replacement surgery can be life changing. But is it right for you? It’s a tough decision. On one hand you’ve got the promise of pain relief and regaining much — or possibly all — of the mobility and independence you want. But, you’ve also got questions. What are the risks? What type of knee is best? How do you find the very best surgeon? Why your knees wear out. Few joints in the body do as much every day as the knees. They help you walk, climb, carry heavy objects, and work. In fact, every step you take on level ground puts one to one and a half times your body weight on each knee. Make that two to three times your weight, when you go up and down stairs. And if you’re a few pounds heavier than you’d like, your knees are getting hit with an extra four to six pounds of pressure for every extra pound! Do achy, noisy knees automatically mean they’re “bad enough” for a total replacement? If you do need a replacement, or think it’s time to seriously consider it, Harvard’s Total Knee Replacement guide is invaluable. You’ll find a list of critical questions to ask your doctor about his or her credentials and experience—the best doctors welcome these questions—to help ensure you have the best possible surgeon. In addition, you’ll learn the basics of the various types of knee joints available (there are over 150 implant designs) so you can work with your doctor to find the best type for you. You’ll even learn why implants with special features that sound great, may actually have a slightly higher risk of complications. And, since this is often elective surgery, Total Knee Replacement explains the many benefits of prehabilitation. This type of physical therapy may be help you have a shorter hospital stay, less post-op pain, and even a faster recovery. You’ll also learn why minimally invasive surgery may sound like the best option, but could make it harder for your doctor to install the implant… common reasons implants fail and how to help avoid these problems and so much more. Are your knees worn out? Knee replacement can be life-changing. It reduces pain dramatically and boosts overall quality of life. 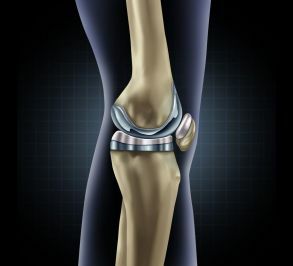 Studies find that 80% to 90% of people who undergo knee replacement are happy with the results. Like a pair of shoes, an artificial joint has a limited life span. The good news is that it’s now quite normal for artificial knees to last 15 to 20 years. With continued advances in the field, it may soon be normal for them to last 25 years. Not all total knee replacement procedures are successful. Some implants fail early, typically because they loosen or become infected. The failed implant usually needs to be removed and replaced, a procedure known as revision surgery. Knee reconstruction also comes with other risks, as well as benefits. You’ll need to fully understand them in order to make an informed decision. Should you choose to have knee replacement surgery, another important decision is when to do it. The right timing depends on your age, level of pain and disability, and general health. If you’re wondering whether total knee replacement is for you, this guide can help you make that important decision, in consultation with your primary care doctor and orthopedic specialist. The guide explains why people end up needing knee replacement, the alternatives to surgery, the different types of knee implants, the risks and complications of surgery, and how to make a safe and full recovery.